Update: EA has confirmed that it now plans the Anthem game release in early 2019 instead of fall 2018. It claims the delay was driven by business strategy rather than development concerns: as a new franchise, Anthem may benefit from skipping the holiday rush to 'own' a less-crowded release window. And this way it won't directly compete with EA's own new Battlefield game, currently planned for October. Original story: BioWare is putting all of its eggs into one Anthem sized basket, according to a new report from Kotaku, which suggests that the open world multiplayer shooter from the studio behind Mass Effect and Dragon Age will likely be delayed well into 2019, despite the Fall 2018 release window first teased in last year’s E3 reveal trailer. 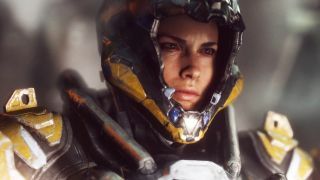 The majority of staff within both of BioWare’s development studios are now working on Anthem, Kotaku’s Jason Schreier reports, citing three internal sources who spoke on the condition of anonymity. Though one of those sources state that the still official release of 'Fall 2018' was “never realistic”, the factors behind a potential delay have been accentuated by BioWare’s desire to make Anthem as great a game as it possibly can be in the wake of controversies surrounding other similarly online-focused titles like Destiny 2 and Star Wars Battlefront 2. In addition, following last year’s uneven reception to Mass Effect: Andromeda, Schreier reports that there is a feeling amongst employees that the future fate and identity of the BioWare is “inextricably tied to the game.” This, in addition to hurdles in development process related to persistent issues with DICE’s Frostbite engine, has made the prospect of a readjusted release date all the more likely. If Anthem is officially delayed, an early 2019 launch makes the most sense, as this aligns with EA’s financial year, and it’s doubtful that the publisher would allow for any further delays that could do more damage to its already shaken stock value following the Battlefront 2 loot box uproar. In slightly more hopeful BioWare-related news, Mark Darrah, an Executive Producer at the studio, recently tweeted out a promising update on the state of the next game in the fantasy RPG series, which will apparently be a reboot of sorts after 2014’s Dragon Age: Inquisition. Interestingly enough, Kotaku’s report also states that the next Dragon Age title has been rebooted with the intention of infusing more “live” elements into its infrastructure which, although not much to go on, does suggest something more in line with EA’s recent pivot towards a 'games as service' model for its bigger titles. What are your thoughts on the rumoured Anthem delay? Would you have preferred to play the game sooner, or would you rather wait and allow BioWare to give the game that extra spot of polish? Let us know in the comments!